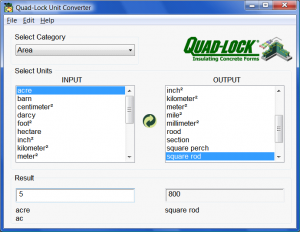 Quad-Lock Unit Converter is a freeware tool that can take care of all your unit conversions within seconds. It contains more than 1000 units of measurements commonly encountered while solving engineering or everyday conversion problems. It includes a Search function to quickly find units, support for adding custom units, and a smart input box that evaluates calculations & complex expressions. Only the most common units are visible by default (e.g. Area, Distance, Temperature, Velocity) but hundreds more are included and easily found using Search. Simple & clean user-interface makes the learning curve non-existent to convert most measurements under the sun, even for inexperienced computer users. Fast and time efficient. There is no need for an installation package, no splash screen, and no silly registration or survey forms. The program is launched in less than a second, a Search function makes it easy to find any unit (even hidden ones), and conversions are performed instantly while typing input. The program can be run from a USB drive as a completely portable application, without leaving any personal data or registry settings behind. Excerpt: This Site, the Materials and information accessible through this Site and the Software are provided “as is” without any representation or warranty, express or implied, of any kind, and Quad-Lock, its affiliates and their suppliers hereby disclaim all warranties and conditions with regard thereto, including, but not limited to, all implied warranties and conditions of merchantability, fitness for a particular purpose, title and non-infringement, and those arising by statute or otherwise at law, or from a course of dealing or use of trade. Quad-Lock does not warrant that this Site or the Software will operate without interruptions or that it will be error free. Customizations: For custom units and preferences to be stored, a small file named UnitConverter.ini (or after the name of your exe file) is written to the %APPDATA%\UnitConverter folder or, if running from a removable drive, to the removable drive’s root folder. You can transfer this file to other computers to transfer customizations. Added Conversion History providing quick access to the 25 most recent unit conversions. Added a ribbon menu with customizable quick access toolbar, and dockable windows for Search and the new Conversion History. Added new category Currency with 38 world currencies. For the built-in currencies, the conversion rates are dynamically updated from the web (once per day) or by clicking the status bar or under menu Edit > Preferences > Currency tab. Added new category Permeability with 4 units. Added cubic millimeters to Volume category. Added ‘Clarke 1866 (NAD 27)’ to Coordinate transformations. Added the name of the currently selected category to the window title (for easy task-switching when running multiple windows). Minor revisions and corrections of several unit conversion factors in torque, pressure, and volume categories to improve accuracy of results. Added ability to perform coordinate transformations from latitude/longitude to UTM (and vice-versa). Re-organized main menu. Also, added an icon next to each menu item. Quad-Lock Converter now uses Unicode for the entire program (UI controls and the engine), enabling internationalization. Changed location of UnitConverter.ini (preferences file) to the %APPDATA%\UnitConverter folder or, if running from a removable drive, to the removable drive’s root folder (e.g. F:\UnitConverter.ini). The conversion engine now uses a hash table to efficiently map unit names to associated conversion factors. This should improve speed on old and obsolete computers (the difference may not be noticeable on fast modern computers). Added ability to enter additional complex expressions in the Input Box, e.g. type: sin(4e-1)+cos(sqrt(7^3)) The converter evaluates the expression to 1.3356883 before performing the conversion. You won't find a better converter than this. This is an excellent program, and I thank the creator of it for sharing it!" Pros: Easy to install - literally takes seconds. Very simple to use. Has pretty much any unit you can think of, and you can always add your own. Summary: This should come pre-installed on all computers like the calculator does"
Summary: -it is exactly what I need and expect"